I typically don’t write about upcoming shows, but there are a few that have just been announced that are under the radar. 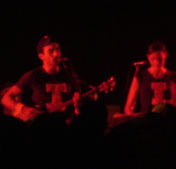 Sufjan Stevens at Sokol Underground, Sept. 20, 2005. Packed it was last night at Sokol Underground. It was sold out, and we’ll leave it at that. Packed from stage to the merch table, wall to wall, a mass of humanity come to see Sufjan Stevens and his 8-person band of cheerleader musicians dressed in their Big “I” T-shirts, some holding pompoms, all playing a myriad of instruments, most singing. The pompoms weren’t mere props. Stevens and crew began four or five songs with well-choreographed cheers, complete with arm signals and spirit fingers. It was that kind of set, a goodhearted rah-rah for ol’ Illinois, all in celebration of his second “state LP,” this one dedicated to The Prairie State. Seriously, at times it was like listening to a choir led by a little guy in a Cubs hat with a voice that was a morph of Art Garfunkel and Ben Gibbard singing lullabies to Jacksonville, Decatur and Chicago. I didn’t know what to expect from the arrangements, I knew Stevens would be hard-pressed to recreate the lushness heard on the CD. But by God, he captured the majesty thanks to the glockenspiels and brass (especially his trumpet player) and keyboards and battery of percussion and those four female cheerleaders whose angel-voices made the whole thing float. Listening to Come on Feel The Illinoise as I write this after the show, I think everything was a tad funkier live, especially “Decatur,” which sported a nice bass riff and finger snaps and probably some sort of synchronized cheer-dance. After playing high school pep-rally standard “Varsity,” the band came back and did a one-song encore that nicely rounded off the hour-long set. It was one of the best shows I’ve ever seen. Considering the overall glumness of his new record, Carrie & Lowell, I don’t expect the Orpheum show to be as light-hearted. Still, this is must-see stuff. Presale tickets available here beginning tomorrow at 10 a.m.
Another must-see show announced today, Low plays Reverb Lounge Nov. 12. One show of note tonight: Minneapolis four-piece Author plays at Reverb Lounge. Their most recent release, Of Brighter Days, came out this past January (listen to it below). Kind of Washed Out meets Owl City, sort of. Opening is KC’s The Author and The Illustrator and EKLECTICA. $8, 8 p.m.
Also, the Good Living Tour rolls into North Platte tonight for a show downtown on “The Bricks,” (whatever that is). On the bill: A Ferocious Jungle Cat, Brad Hoshaw and the Seven Deadlies and M34N STR33T. Oh my, what those railroaders are in for… The free show starts at 8 and is all ages.